Some apps run in the background and use the WiFi or mobile data service. If you don’t use the app often, you should either remove it or change the settings of your phone to make sure that the inactive app doesn’t consume data. Not all apps are junk. Some applications are important and you must not mess with their settings. For example, the OS updater application makes sure that your phone software is up to date. If you disable it, your phone might be vulnerable to security threats. To identify apps that are using WiFi or mobile data connection, you must use a data monitoring app. 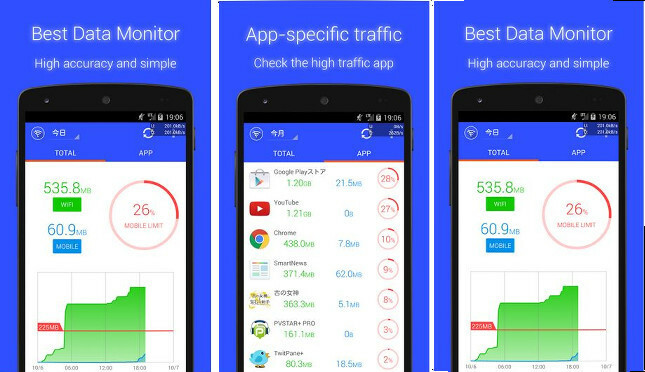 DU Monitor is a popular data tracker app on the Google Play Store. It has an excellent rating and a million active users. DU requires Usage access permission to function. Before it starts monitoring the phone, the app will ask you to turn on this permission. DU monitor is easy to use. 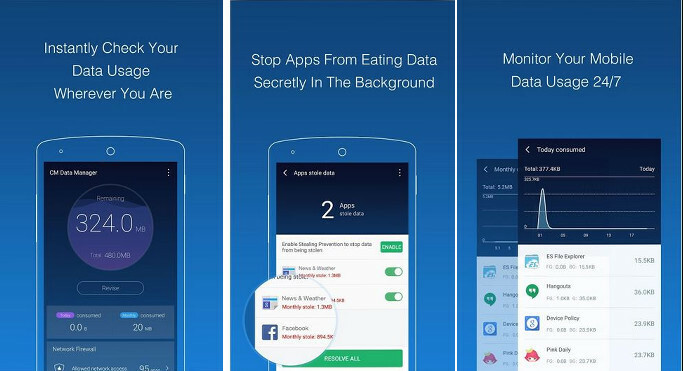 To use the app, all you to have to do is set the monthly, weekly, daily data limit. Once you set the required values, DU Monitor will get into action. The app will display app-wise usage of mobile/WiFi data. You can sort the list by their WiFi or mobile data usage. The DU Monitor app displays a beautiful graph that indicates the amount of data you’ve used today, yesterday, last month, etc. The app has the option to exclude WiFi or mobile data from the graph. It provides a refresh button to refresh the data. It has a great interface. Simple Net Meter is not as popular as DU Monitor, but it has many features. The app lets you ping IP/host. It also allows you to trace the route of data packets. The app allows you to find nearby WiFi hotspots. It displays the signal strength, bandwidth, channel and encryption protocol used by the WiFi hotspot. SNM allows you to network usage by the network interface. It makes you aware of the active data connections on your phone. You can see the IP address and hostname the app is communicating with. The SNM app displays the total data used by apps and the connection speed in the notification panel. It allows you to set the data refresh interval level, the start date of the billing cycle, and the amount of the data you’ve bought from the ISP. Cheetah Mobile’s data tracking app has 5 million active users and a nice user interface. 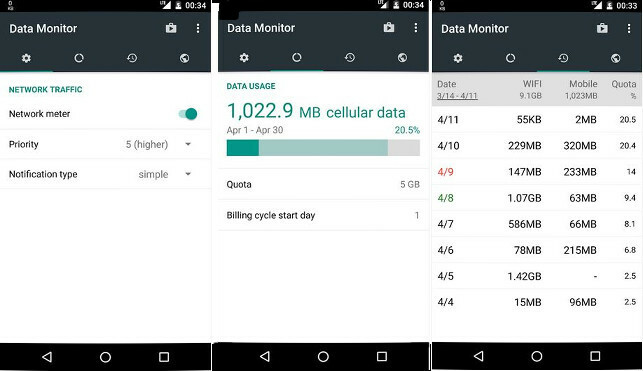 The app allows you to set a monthly data limit. When you’ve reached the limit, CMDM will display a notification. CMDM displays the network connection speed and data usage in real-time. The Data Manager app has a firewall module with which you can block or allow other apps from accessing data. The firewall can prevent other apps from stealing your data. To use this feature, you must enable a VPN connection on your phone. The app allows users to share their data connection with users nearby them. It lets users find free WiFi hotspots. It ships with an internet speed tester utility. CMDM is a nice app, but it has many limitations. MDM is the smartest and most popular data monitoring app. It supports Android and IOS operating systems. The app starts tracking the inbound/outbound network traffic when you select your plan type and enter its details. The MDM app supports roaming and shared plans. It lets you set up usage alarms. The alarm will trigger when you’ve reached the threshold value you’ve set. MDM application can display data usage by location. To use this feature, you must allow MDM to read your location. MDM makes users aware of the apps consuming the most data. It lets you export the network usage data to a CSV file. The My Data Manager app generates a beautiful network usage graph for the data it has collected. The graph is updated in real-time. If you’re located in the US, MDM will analyze your data, voice, SMS usage and recommend a plan that will save you money. Apart from data, you can see the number of minutes you’ve spent on calls and the number of messages you’ve sent with this free application. 3G WatchDog is one of the oldest data monitoring and tracking app. Although its interface is not as good as other apps we’ve shared here, 3GW is accurate and lightweight. The app tracks mobile and WiFi usage. It displays the recorded data in a table. 3G WatchDog allows you to see the data consumed by apps and services in real-time. The app enables you to set counters and alerts. 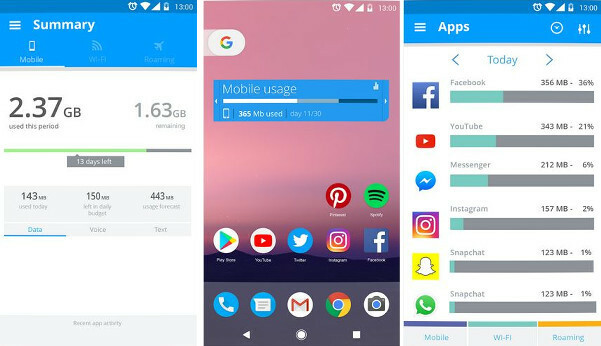 Users can configure this app to automatically refresh the interface after a certain duration and disable the data connection when your data usage has reached the threshold. 3GW lets you reset the usage counters. Users can backup or restore the data usage records with 3GW. The app supports 20 languages. 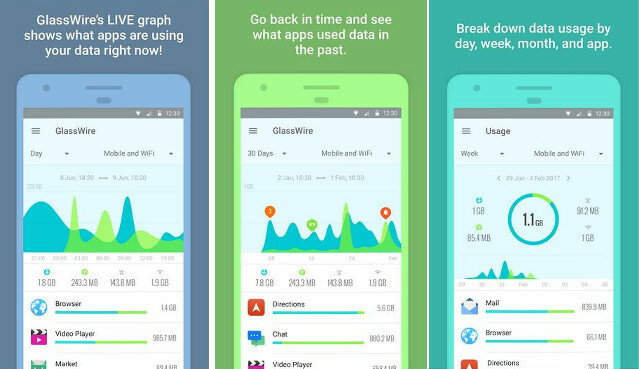 Like other data tracking apps we’ve covered here, GlassWire requires usage access permission to work. Once you grant this permission to the app, GW will start monitoring the network interfaces on your phone. GW displays the list of active/inactive apps that are sending or receiving data. It generates a graph for the same. You can see the amount of data you’ve used in the last 90 days in GlassWire. The app enables users to filter the record by connection type. It also lets users create custom alerts. 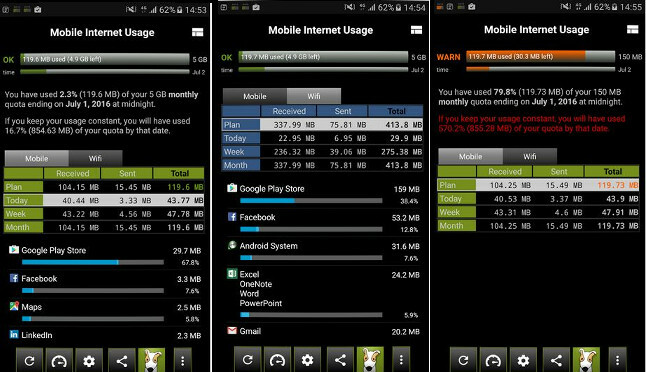 The app has the option to enable/disable bandwidth meter, change interface language and set the interface refresh time. The default theme of this app is great. If you don’t like it, you can switch to one of the six cool themes provided by GlassWire. GlassWire, CMDM, MDM, Simple Net Monitor, 3GW, and DUM are the best tracking apps for mobile devices.